I had the pleasure of going with a friend to a place called “Chikalicious,” a little dessert spot in New York where the simplest ingredients are arranged to be delicious pieces of culinary mastery*. We waited briefly and then we were ushered into the quaint space that was the size of my kitchen, but resembled something out of Stanley Kubric’s A Clockwork Orange. I was LOVING this!! Minutes later, Mr. Chikalicious came up to our table with the most stylish bowtie that I’ve seen in my lifetime. I immediately felt a strange unction to wear a bowtie and to eat lots of desserts. I was under their spell! 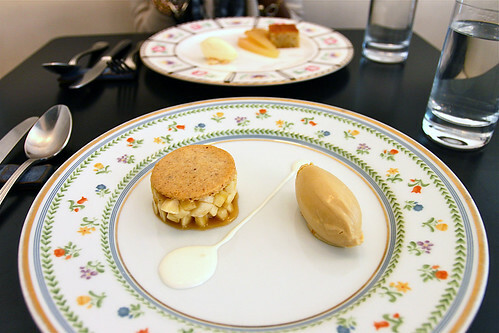 After reviewing their menu, I was amazed by their great talent to make boring desserts sound like palatial creations. Their menu had items like, “Fromage Blanc Island with poached pear puree and a spiced fig pudding cake,” which basically means “a slice of cheesecake with pear juice and banana pudding.” The descriptions alone made my mouth water and I wasn’t even hungry! I asked the waiter dude, “what do you recommend,” which opened the door to an even more impressive description. The passion that came over Mr. Chikalicious’ face as he described the preparation process for bananas and pears made me believe that he planted the fruit and raised them like they were his children. By the end of his description I was convinced that the bananas and pears that were used as ingredients were sent to the best private schools, participated in extracurricular activities and graduated with a 4.1 GPA. I was confident that whatever I ordered was going to be amazing. After the nice, light dessert appetizer we were presented with our main courses that lived up to the hype. There were three simple things on my ornamental plate, but I knew that these things were created with love. The bananas that were described to me earlier were so carefully chopped into miniature triangles and carefully packed into a neat pile. 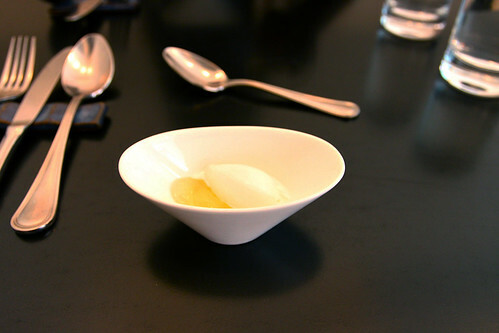 The pudding puree was streaked across my plate, appearing like a miniature liquid spoon. I had to use tremendous force to stop myself from licking this directly off the plate. The ice cream was so small and unassuming, but tasted great, like there were tiny chunks of my hopes and dreams in it. I was a bit impressed, to say the least. When I left Chikalicious I was so happy with my experience that I wanted to make Bowtie dude and Ms. Chikalicious the Godparents of my kids and the beneficiaries to my life insurance plan because their dessert was that good! * that was the most triumphant description that I have ever given anything in my life!